Glass, the long-awaited Unbreakable sequel, which also serves as a sequel to last year's Split, finally arrives next year. 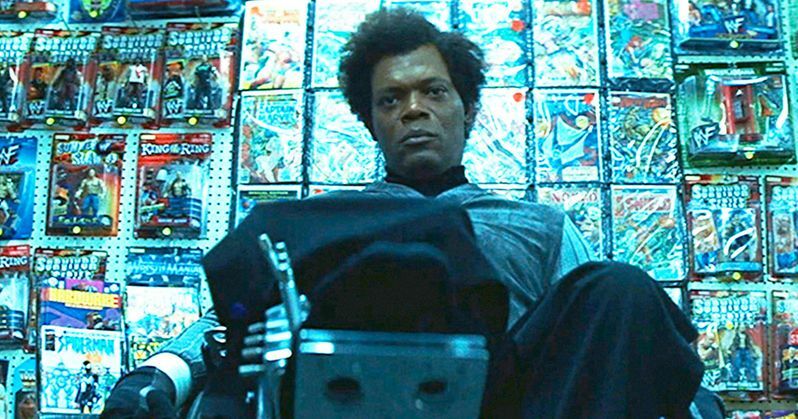 Samuel L. Jackson is back as Mr. Glass and, while the M. Night Shyamalan feature has been pretty secretive up to this point, the actor has shed a little light on what we can expect, at least from his character. Samuel L. Jackson has been making the press rounds for Incredibles 2, which is another long-awaited sequel that arrives in theaters this weekend. During a recent interview, he was asked about Glass and dished what he could. It wasn't much, but he discusses a bit about his character's motivations and how incredible James McAvoy is. Here's what he had to say about it. "All of a sudden, my character has the thing he wanted: the heroic good guy, the bad guy, and I get to be in the middle of them. It has a distinct satisfaction if you remember what his theory was all along, that there are people out here with extraordinary powers who can do extraordinary things. And it's amazing to watch James [McAvoy] have an argument with four different characters in front of my face." James McAvoy turned in one of the best performances of his career in Split as a man with multiple personalities, varying wildly in from character to character. It sounds like that is once again going to be on full display here when the Beast makes his return to square off against Bruce Willis as David Dunn. Unbreakable was released as M. Night Shyamalan's follow-up to The Sixth Sense back in 2000 and is still considered to be one of his best movies to date by many. It may have taken nearly two decades, but the success of Split managed to finally get this movie made. "I remember when Night called me last year to say, 'I need you to watch this movie I just made, and after you watch it, I'll tell you what I'm thinking.' So I watched Split, and at the end of it, we get Bruce in the café and the woman talks to him about Mr. Glass." Jackson gasps in surprise, recalling the moment. "I was like, 'So are we gonna make this movie?' And Night says, 'Well, it depends on the opening weekend.'" Split made $40 million on its opening weekend and ultimately brought in $278 million worldwide, working from a budget of just $9 million. As such, Glass got put on the fast track and the movie has already completed production. Blumhouse and Universal are set to release it in theaters on January 18, 2019. Some footage was shown at Cinemacon earlier this year and was met with a very warm reaction. There's no telling when we'll see a trailer, but a teaser could show up sooner rather than later as Universal has some big movies coming down the pipeline they could attach it to, such as Jurassic World: Fallen Kingdom or The First Purge. This news comes to us courtesy of Vulture.